New businesses will launch in Americana Zachary, an award-winning new home community located in the top-rated school district in Louisiana. Kidz Karousel, one of two new family-friendly businesses coming to the Americana new home community in Zachary, La. Americana, a traditional neighborhood design community in Zachary, Louisiana, is proud to announce two new commercial developments that will enrich the lives of homeowners in Americana and serve residents of the surrounding area. Construction of Kidz Karousel Early Childhood Development Center and Cheauxnaniganz Family Entertainment Center is slated to start in fall 2017. Americana is served by the Zachary School District, which has been ranked as the No. 1 school district in the state for 11 years in a row. The two new businesses coming to Americana will add important new services for parents and their children, making Americana an ideal home for families. Kidz Karousel, a 12,000-square-foot facility, will provide child care services and educational programs for 189 children, ranging in age from six weeks to 12 years. The new facility will offer childcare from 6 a.m. to 6 p.m. all year round. Located conveniently off Mt. 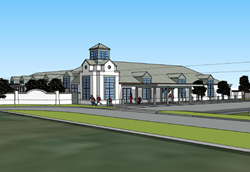 Pleasant Road and Americana Boulevard, Kidz Karousel will offer an easy drop-off and pick-up access point for parents in Americana, as well as parents from the surrounding area. Cheauxnaniganz Family Entertainment Center will be located next door to Kidz Karousel, with direct access from Mt. Pleasant Road. The 15,000 square foot facility will provide a wide variety of family entertainment options, including a ropes course, an arcade, laser tag, online gaming rooms with online tournaments (eSports), a restaurant and several party rooms. With something for every age, Cheauxnaniganz Family Entertainment Center will engage families from toddlers to adults. The new businesses in Americana are part of the developer’s vision to provide homeowners and the town of Zachary a safe community and unique amenities that create a distinctive lifestyle for residents. Tessa and Derrick Holloway, owners of Kidz Karousel Child Development Centers and Cheauxnaniganz Family Entertainment Center, have more than 10 years of experience in child care and development. The Holloways and their management team – which consists of Soni Caballero, executive director for all Kidz Karousel locations, and Zachary resident, Deirdre Bergeron, who will be the director of the new facility in Americana – are proud to serve local families and children. “Our passion for the childcare industry began more than 10 years ago when my husband, Derrick, and I purchased our first facility,” co-owner Tessa Holloway said. “My husband Derrick and I are ecstatic about expanding our business and reaching out in the Zachary area, nestled in the quant and sophisticated Americana Development,” Holloway said. The Kidz Karousel team includes licensed trainers for the State of Louisiana in childcare, as well as certified trainers in CPR and first aid. The team also includes Teaching Strategies Gold-certified class reliable observers, the highest-rated curriculum in Louisiana. Staff members of Kidz Karousel have also served on the workforce and education committee of the Louisiana Association of Business and Industry (LABI) and are current members of the Head Start Advisory Committee. The two new businesses add additional services and appeal for families in Americana and the surrounding area. “Americana continues to provide homes that offer beautiful architecture, quality construction, energy savings and many options that enable owners to personalize their home,” Enquist said. “Americana’s Community Center, The Pointe, provides events and concerts for our homeowners to enjoy. The addition of Kidz Karousel offers high-quality child care, before/after care and holiday care. And soon, Cheauxnaniganz will offer fun entertainment for everyone in the family. Best of all? Each of these amenities are within walking distance from your home,” Enquist said. The largest traditional neighborhood development in the Baton Rouge area, Americana offers many amenities that include a Town Square, Waterfront Park, restaurants and retail stores – as well as green space, a dog park and The Pointe event facility. For more information on Americana, please visit http://www.americanazachary.com/.